Hello, my name is Bob Luchowski, and I've been painting miniatures since just before the creation of dirt. That, in no way means that I'm any good at it; there are far more artists out there who are much better than I. It does mean, however, that I have a ton of experience at it, and can pass it along to the more inexperienced. Many of the ideas I have learned over the years have come from obscure magazine articles, archaic books and manuals, adaptation, and by plain old logic. 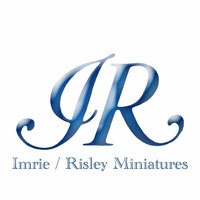 I do urge you, however, to get a copy of the "Model Soldier Manual" by Peter Blum from Imrie/Risley Miniatures. Written so many years ago, its basic instructions are on ideas of how to paint a miniature as envisioned by Peter, Bill and Clyde, three of the foremost pioneers in the industry. (Try to obtain an original hardcover version.) To this day, I still use it as a reference. To begin with, let's just pick out a figure. I assume you have an I/R catalog at hand. Yes, I'm plugging I/R again. Bob Knee, one of the most famous of artists, once told me that "everybody has cut their teeth on I/R Miniatures." It's true, because they have the most extensive collection in the U.S., if not the world. What era is your best interest? The French and Indian War, the Revolution, the Civil War? Or, if you aren't sure, then start out with the simplest. There are at least three: C-49, Merlin the Magician is very good, along with C-179, the Ghost of Christmas Yet to Come. They will teach you the basics of blending colors into folds to create shadows. A miniature of this size cannot create its own shadows, and must be helped by placing darker colors in the depressions and lighter shades on the ridges. The trick is to blend them into a continuous color, changing with the available light. Scrooge, C-116, along with Merlin, is good for practicing painting faces and hair. A tip on the latter: paint the hair black and dry-brush white, to your taste; OR, paint it a light tan and give it a light wash or two of brown, red-brown or black, and, with a light color dry-brush to taste. Whatever the era, choose a simple figure to start, and work your way to the more difficult. No lace, no 'chicken guts', no fancy decoration Whichever you choose, it will, I promise, turn out to be a masterpiece. Not only that, but it will also be a gauge for the future, so don't ever repaint it. In a few years, it will tell you how far you've come. Hi, Bob again. When I was young and stupid, I held the figure I was painting 'twixt thumb and forefinger, and couldn't figure out how to keep the paint on the hat and base from rubbing off, while the successive repainted coats got glossier and wouldn't adhere so well. A friend then gave me a set of oils and my troubles became tenfold At least the flats dried faster and didn't smudge so easily. Suddenly I had an epiphany! Every cheap screwdriver set always had a stubby screw end on a handle that no one can ever figure out what it was for, and is usually the only piece that you can find when you really need a screwdriver. Well, since I now needed this piece, I couldn't find one, so I went to the hardware store and bought a dozen 3/4" sheet metal screws and a 3/8" dowel. All of this cost less than three dollars. I cut the dowel into 4 inch pieces and drilled holes, about the size of the screws, directly into one end of each piece. I cut off the heads of the screws. You can clamp them in vice grips and use either a bolt cutter, a hacksaw, a Dremel cut-off wheel, (or perhaps a small guillotine) and screwed them, headless end first, into the dowels. A bit of epoxy glue wouldn't hurt. I drilled several holes, straight down, but NOT all the way through a scrap piece of 3/4" wood, spacing them about 2 inches apart. I now had a stand, which I could use for several figures at a time, without ever having to touch them until they were dried. The trick is to drill into the bottom of the figure by locating an 1/8" drill bit directly in the center of the bases if you're adding groundwork, or directly under the figure's ankle. The hole need not be too deep, just enough for the screw to have a solid bite. This stand is easily and quickly made for less than a few dollars and allows you to hold the figure in any position and helps steady your painting hand for finer detailing. What was I going to say? Oh, yeah, I wanted to remind you, if I hadn't mentioned it before. (My mind is getting as tottering as my knees!) If you are using oils, make sure you try Winsor/Newton's Liquin. A supposedly wise old art professor once told me that there is NOTHING that will speed the drying of oil paints. Until Clyde Risley told me to use Liquin. It cuts the drying time in half, is a great medium to thin paints, and you only have to use a tiny bit. When I tried it, I was dancing on air (this was prior to my knee tottering period.) I always keep a small puddle of it near my pallet, and one jar will last forever. Now to my favorite colors for faces. Be they oil or acrylic, they work the same way. Ah!! One of my favorites - Cadmium REd Light! However, I must warn you, it is a strong and intense color, and a touch of it goes a loooong waaay! I think it was created by either Beelzebub or a Jabberwock. The other color is Burnt Sienna, not to confused with Burnt Umber, which is a great color to lightly shade lips. After painting the eyes white (or off-white for a tired look)and adding the irises, you can outline them with Burnt Sienna (using an 18/0 liner from Loew-Cornelle, you'll never go back!) Then, mixing a little BS (no offense) with Flesh color, you can outline the shadows of the flesh areas: blending around the eyes, around the nose and the chin, the neck area, the ears and between the fingers and toes. Using a lighter Flesh, color the highlighted areas: the cheeks, brow, nose, chin and earlobes. Now comes the gentle part. Using just a touch of Cad Red, mix it with the Flesh and LIGHTLY shade the highlighted areas, including the earlobes and palms of the hands. If you're daring try it on the finger and toenails. If you're painting an Indian, an African America or Hispanic figure, add a bit more BS and a touch of Cad Red to Flesh for a skin tone. Mix these colors on a separate piece of paper until you get the the shade you like. REMEMBER, the different shades should blend and feather together lightly, with no sharp lines separating the colors. Hi, let's talk metal. Tough, steely, heavy, manly macho metal. It's the sinew of society. Without it, war would cease to be!.......Hmmmm......Sure as shootin', someone would probably re-invent the sling. Private weapons and rifles, though, usually retained a dark, steel gray color, and Indian weapons, believe it or not, had a rustier look. As brave as they were, they hadn't acquired the white man's technological skills. There are several ways to treat metal, and they also apply to buttons, buckles, sabers and other equipment: first you could apply commercial metal blackening treatments before priming the rest of the piece and polish to taste. Or you could just give it a simple wash of black and polish to taste. Or, the method I use, paint all metal parts black, then lightly apply the metallic colors as needed. Since I save the metal treatment for last, I always treat the figure to a nice, refreshing coat or two of flat lacquer. Testor's Dulcote works well. Not only does this allow the different colors to give off the same cloth flatness, but it also seals the paint. Without it, any glitch you have with the metals is almost impossible to repair. With it, any excess metallic paint is more easily removed with a damp brush. Hi, Bob Again. I propose that you prefer to practice patience plus personality when posing a particular piece to proper perfection. To what Purpose? A painted figure by itself can be a nice item. Put it on a wooden base, and it's even better. Add groundwork and it really looks terrific. But it he is holding his rifle at, say, port arms and looking straight ahead, he's still a figure. Now, twist his head to the right and tilt it just a bit forward, and he's seen something. Tilt it forward and slightly down and lower his arms a bit, and he might be tired. We're lucky in that many of the i/R figures are already cast in action poses, but some might require a bit of tweaking, to your taste. For example, I took a 48th Foot Grenadier (C-122) and put him on a base with the suggestion of a stockade and a few boxes and barrels (easily made from a few sticks from the backyard and scrap pieces of wood.) Then I cut off his head and positioned it so that he was looking up and over his shoulder. Now, instead of a stern grenadier, he was a very frightened man on guard duty in a wilderness filled with Indians. Similarly, I took a Continental Marine and put him on a base with a scratch-built dock, again, easily made with scraps of wood, and added a couple of boxes and some sacks and coiled rope. I thought that was good enough until I remembered I had a small figure of a duck. I put him in the water by the dock an turned the Marine's head to look at him. He seemed to be thinking -- "dinner!" The whole point of this is that all you have to do is tun a figure's head, or put him in a situation, no matter how simple, and he suddenly becomes, not a figure, but a story! Feel free to exercise your imagination.. It will probably turn a hobby into an adventure. Okay, let's talk Christmas. After all, I am a close, personal friend of Santa Claus. When I first met Bill Imrie, just after they invented the wheel, he and Clyde were introducing a new line of figures, focusing on Dicken's "Christmas Carol". When he sent me the Scrooge and Marley figures, I embarked upon the first diorama I'd ever done. What I learned was that you can create great scenes; as long as you use your imagination. I added a floor to a wooden base, made three walls; one with a fireplace, one with a window, and one with an old fashioned door. All of this was scratch built, which I found to be simple. All you have to do is find pictures of what you have in mind and apply a little energy using cheap basswood strips (NOT balsa! ), a saw, glue and a knife. I made a chair out of putty, a bowl and spoon out of flattened lead and surrounded Marley's feet with punched brass, painted gold (to hide his base). A used dryer/ softener sheet makes great curtains. This diorama was a present to I/R Miniatures, and also a learning lesson. It won an award. But this story is not about my 'accomplishment'. Rather, it is about the outstanding figures I/R made to commemorate the Christmas season. Clyde thought it amusing when I told him that these figures are so easily done that they almost paint themselves. When I received the announcement of the next figure release, Clyde had written across it, "Bob, this one's for you!". It was Mr. Fezziwig, and it looked like ME. What greater honor! What greater honor can be given about I/R's collection of Christmas figures, accurate to the original drawings made for Dicken's release in 1849. The Nephew, the Cratchits, the three spirits, are an accurate representation of the story, not to mention Santa Claus and their other literatry figures, such as King Arthur, Robin Hood, Long John Silver, Sherlock Holmes and all the characters that go with these classic stories. What other manufacturer has released such figures. I strongly suggest that you acquire these figures while they last, because, as we all know, I/R won't be around forever. I must add that these words I've spoken are mine and mine alone. They were not generated by Helen, Carole Anne, or any other person. It is not a 'plug' or paid advertisement. They were meant with all sincerity. To which, I might add, that all these wonderful years I have worked with I/R have been a privilege, a pleasure and an honor.